The state of North Carolina is most well-known for a number of different things: the birth of flight thanks to the Wright brothers at their small airstrip in Kitty Hawk, historically great college basketball, and Bojangles’ Famous Chicken ‘n Biscuits, just to name a few! But one thing that doesn’t come to mind often enough is the connection that North Carolina has with the ocean and the amount of unique sea wildlife in its waters. There is one attraction in North Carolina that has set out to change that mindset and educate the general public about everything the coastal regional of the Carolinas has to offer: The Museum of Coastal Carolina. Stuart Ingram is the founder of the Museum of Coastal Carolina, and his idea for the museum really came from just one simple question: “What kind of fish is that, mister?” His vision and desire for knowledge was sparked one day while fishing on the beach, and he not only wanted to learn as much as he could about nature around him, but also to share it with everyone else. 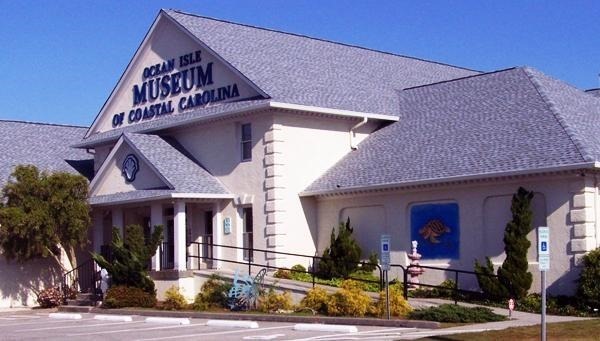 Thus, Mr. Ingram had the idea to create a museum for the coast, and his vision became a reality in 1991 with opening of the Museum of Coastal Carolina. The museum’s simple mission is to stimulate the general public’s interest in and understanding of the natural science, environment, and cultural history of the coastal region of the Carolinas. Plenty of Exhibits and Events for All Ages! Like many of the museums in NC, all of the exhibits here are designed to educate both young and old about the wealth of different wildlife that lives in our very own backyard! When touring the museum, you’ll learn about everything from owls to starfish, seagulls to seashells, and so much more! The museum also has a wide array of special events and lectures throughout the year, such as “Ghost Walk presents Ghosts of Brunswick County!” For a full list of upcoming special events and lectures feel free to check out their website. And after a very productive and interesting day, nothing compares to resting in one of our amazing vacation rentals. McClure Realty Vacations offers a wide variety of homes away from home packed with the ultimate amenities for you and your family. When looking to learn about the history and science that exists right in our backyard in the Carolinas, the best place is at the Museum of Coastal Carolina! For more information on pricing and hours, stop by and see it for yourself at 21 East Second Street in Ocean Isle Beach. You can also give them a call anytime at 910-579-1016.